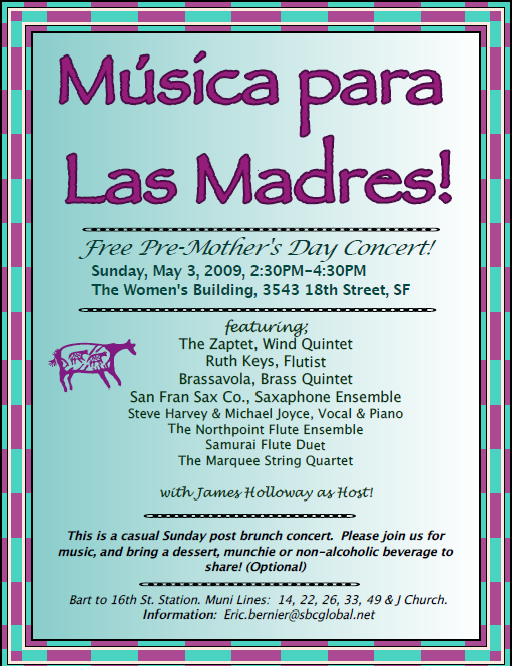 The next performance of the Zaptet will take place at 2:30pm to 4:30pm on Sunday, May 3, as part of a free Musica Para Las Madres Concert concert at the Women’s Building, 3543 18th Street, San Francisco, CA. The performance will feature Carrie Barclay who joins us for the first time on bassoon. We will play the “Early Hungarian Dances” by Farkas. You are currently browsing the Zaptet Blog blog archives for April, 2009.